If Maleficent overheard me commenting on how adorable she looks in this printable party pack, she probably would turn into a dragon and eat me. But I'm going to say it anyway: This Maleficent party pack is cute! 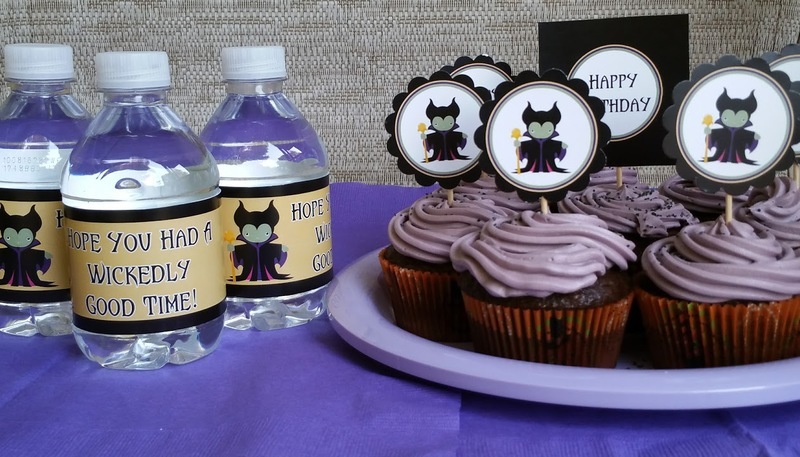 I'm a huge fan of Maleficent and I'm always looking for fun Halloween birthday party themes for my daughter. 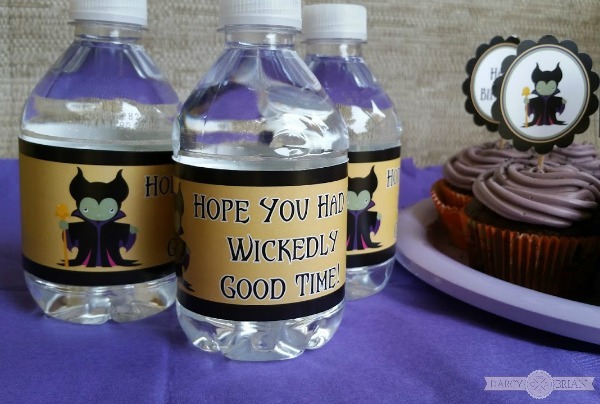 My favorite thing about these printables is they work for a Halloween party OR a birthday party. (And for those lucky kids with Halloween birthdays, it's an excellent combination!) 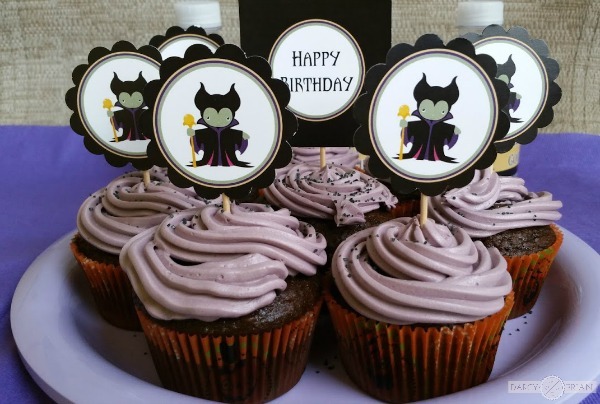 Some of the cupcake toppers say Happy Birthday, but those don't have to be used if you are throwing a Halloween bash. 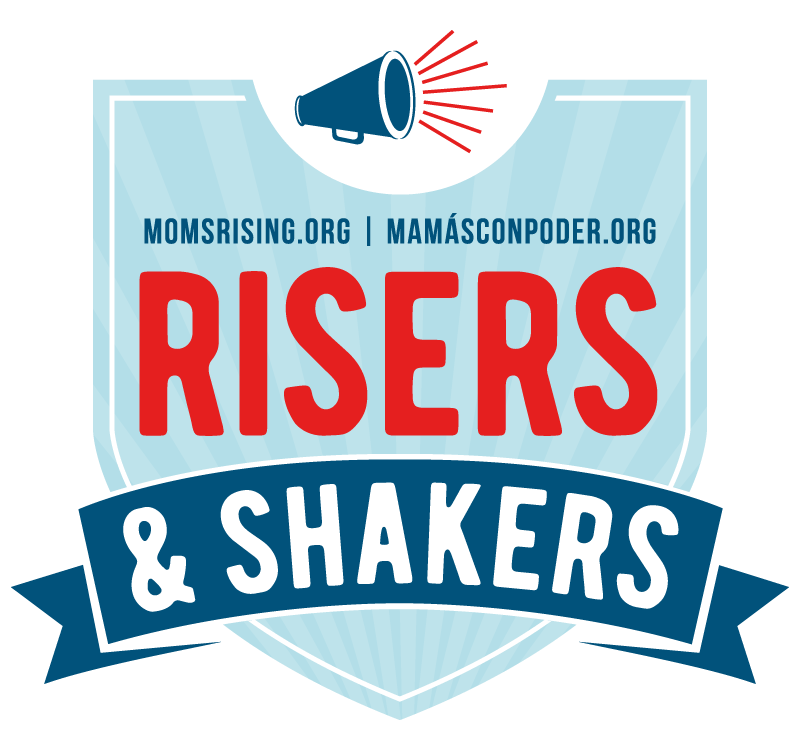 This post contains affiliate links to helpful items and supplies. 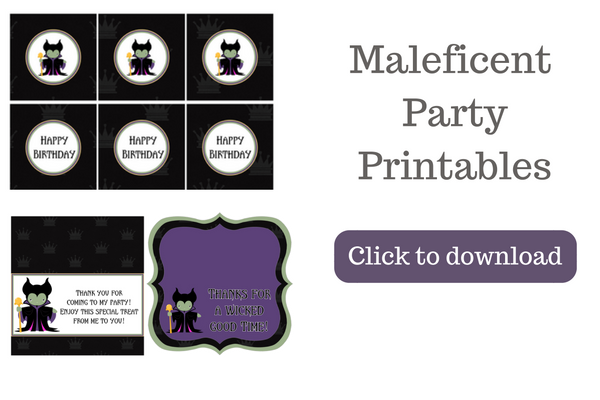 I love party planning and it was lots of fun coming up with this cute Maleficent theme. Even though she is a villain in Disney's Sleeping Beauty, I did not want to plan a scary Halloween party. I mean, I love scary Halloween decorations, but I try to keep a balance of scary and cute while the kids are young. This is a pretty large pack of party printables. You could print them out at home on card stock paper, but I recommend having them printed someplace. I found Office Max to be reasonably priced, but it did take a couple days for them to complete my order. Everything except the Hershey Kiss labels should be printed on white card stock paper. Print the Hershey Kiss labels on a full sticker sheet. This will make them easy to stick on the bottom of your chocolate kisses after using a 3/4″ hole punch to pop them out. You have a couple options for the cupcake toppers. You can cut them out as squares and tape them to tooth picks or use a hole punch. I used a 2″ scalloped hole punch, but you could use a 2″ circle hole punch. It's faster than cutting them out by hand. The treat bag toppers fit on top of Ziploc sandwich bags, quart storage bags, and snack bags. I have not tried putting them on top of a paper bag, but they may fit those as well. Cut them out, lightly score along the middle, and fold in half. Fill bags with party favors and staple the treat bag topper over the top. For the candy bar and water bottle wrappers, you can tape or glue them in place. Add even more fun to your party favors with Maleficent lollipop covers and Maleficent pillow boxes! Pull the entire party together with black and purple plates, cups, napkins, and plastic utensils. This pack of printables also includes a simple party game. Hang up the picture of Maleficent. Cut out her horns. (I'd suggest cutting them out in squares. They are a tad too large for the 2 inch hole punch.) Have guests take turns being blind folded (or close their eyes), spin them around a couple times and see where they put her horns! To keep it easy, I recommend putting a piece of tape on the horns as you pass them out to each player. 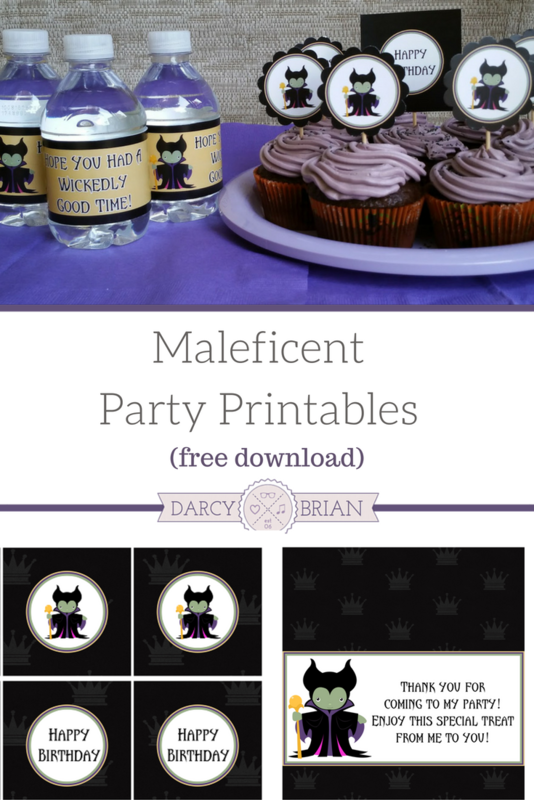 I hope this inspires you to plan a fun Maleficent party! These free printables are perfect for kids birthday parties and Halloween parties. When you download your copy, you may print as many as you need for personal use only.